The Minnesota Timberwolves have the first pick in the 2015 NBA Draft. For a franchise that has become something of a place where players’ careers go to die, this a golden opportunity to put the organization in prime position to be successful for years to come. The question is, who should this team select? If you ask most people, the common belief is that this boils down to choosing between one of two talented big men: Jahlil Okafor or Karl-Anthony Towns. Both of this prospects may have only played one year of college ball but, in that short span, have shown the chops to be top-notch forces at the next level. The Timberwolves, forgive us, have the pick of the litter here. In the end, club will have to determine which one of these players meshes best with its current roster. Minnesota will have to think about the direction the franchise is heading, and which one of these player fits those plans the best. This isn’t one of those scenarios where making the wrong choice becomes the difference between years of disappointment and years of success. Both of these gentlemen are pretty much slam dunks. We know who they’re choosing, allegedly, but which player is really the better choice? Here is your Cheat Sheet to the Towns versus Okafor debate. 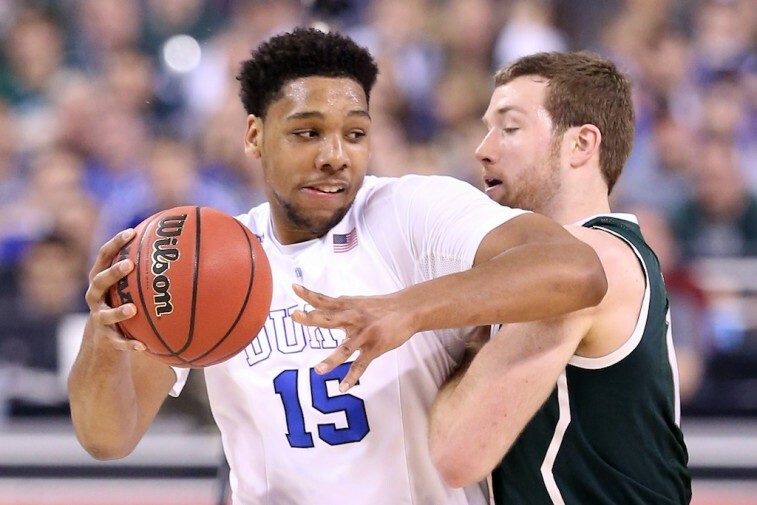 Jahlil Okafor may be 6-foot-11, 270 pounds, but he has the perfect combination of strength and fluidity. He is by far one of the most polished offensive big men to come out of college basketball in quite a while, with an unbelievable post game and a soft touch around the basket, making him nearly impossible to defend one on one. In his one season at Duke, Okafor led the nation in field goals (279), had the second highest field goal percentage in college basketball (.664), and led the ACC in player efficiency (30.7). He was pretty much unstoppable once he got himself in an advantageous position. In Okafor, the Timberwolves would be getting a refined center who can take his man off the dribble, has an array of offensive weapons, and a high basketball IQ. The Consensus All-American‘s intelligence cannot be overlooked. He understands when he’s in prime position, but he’s also skilled enough to pass out of the double team. If Minnesota is looking for a player who already knows his strengths, can compete on the offensive end, and has can provide buckets right away, then taking Okafor is a no-brainer. Plus, we already know that Flip Saunders is a fan. Okafor is not, and probably won’t ever be, a defensive game-changer. He is not an explosive leaper and doesn’t have the athletic upside of some of the other big men in the 2015 draft class. Some have questioned his fitness and conditioning, but recent reports suggest he’s been getting himself in solid shape. Still, because of his style of play and glaring (defensive) limitations, the Duke freshman had consistent difficulty handling the length of opposing players. Another part of his game that needs serious work is his free throw shooting. In today’s NBA, where the “hack-a-player” strategy seems to have gotten out of control, big men need to be able to knock down the freebies. Okafor only average 51% from the line during his lone season at Duke. If he doesn’t fix that hole in his game, he will certainly prove to be a liability at times. While Karl-Anthony Towns isn’t as polished on the offensive end as Okafor, he is bursting out the seams with potential. If the NCAA tournament was an indication of things to come, people should be very excited about this 6-foot-11 forward — he showed he can mix it up inside and also showcased a sweet little jump hook. However, one of the main distinguishing characteristics of Towns, is that he can take his game outside of the paint. Towns has a pretty looking jumper and is more than capable of knocking down the mid-range shot. And if this video tells us anything, he can consistently hit the triple as well. In today’s NBA, it’s always helpful when a big man can extend the floor. Towns provides that element in spades. He is also a reliable free throw shooter; one who averaged 81.5% from the charity stripe this past season. And while that trait differentiates him from Okafor, it’s Towns’s talent on the defensive end of the floor that changes everything. Towns is the ultimate two-way big man. Skilled on the offensive end, yes, but he is a nightmare on the other side of the floor. His length, timing, and affinity for shot blocking – averaged 2.3 per contest – help make him the kind of rim protector that NBA teams salivate over. 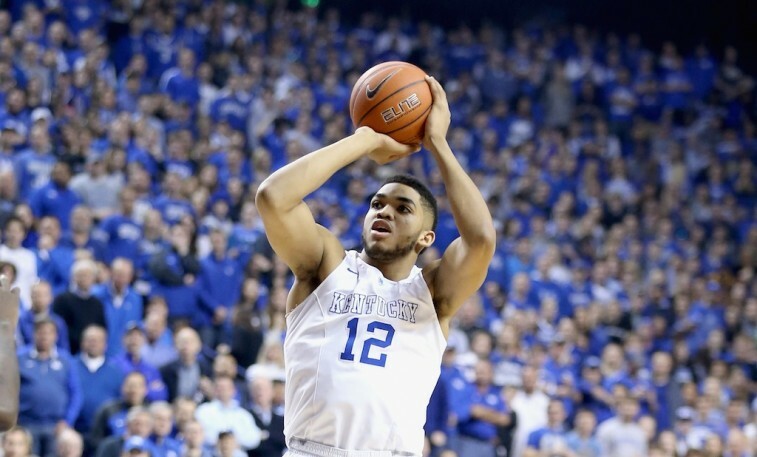 With his potential to dominate on both ends of the floor, the sky’s the limit for Karl-Anthony Towns. Towns played in a system at Kentucky that never forced him to be the main guy. For his skill-set and overall potential, there is still no guarantee that he can be the kind of player who takes over an entire game. Towns needs to work on not getting into foul trouble, and he has has to refine his post game. The only way this will happen is if he gets stronger and works on his lower body. 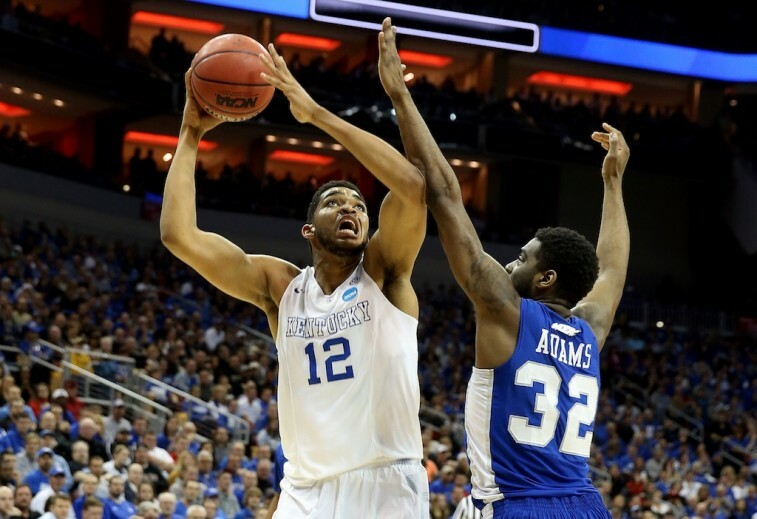 According to NBADraft.net “Despite showing a huge set of arms and shoulders, his lower body strength needs work, as he gets knocked off balance and pushed around at times.” Still, given the progress he made from the beginning of the 2014-15 season all the way up to the big dance, there is no reason to believe Towns won’t be able to work on his shortcomings. Apparently Minnesota feels the same way.